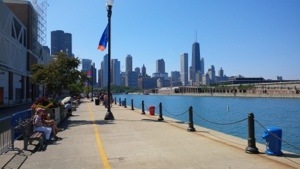 Imagine this glorious summer scene on Navy Pier absolutely cracked open by the sudden low pass of a Harrier jet doing 600 knots coming out of the south and zipping its way to centre stage along the waterfront to North Beach. It was astonishing. He did many passes directly overhead, with one more at impressive speeds. Susan said that I beam a special smile reserved for these occasions. I suspect that the kid in me emerges at just such times. Wow! I see words hidden in sentences! I see clues in the sentences… Find the embedded word clued within the sentence below. Imagine my disappointment when the excavation expected to yield bygone treasures instead brought to light only bricolage – jejune art, hingeless doors and discarded dolls. The Muppets deliver a funny parody of the Sons of Anarchy. And I want one of their leather jackets! The Hundred Story Wood Young Writers’ Workshops return September 30, 2013 with a day of creative writing workshops for aspiring high school aged writers. We have four outstanding mentors eager to work with students; they include novelist/blogger Grace O’Connell, graphic novelist Scott Chantler, novelist/publicist Corey Redekop and teacher/novelist Patricia Westerhof. Contact Adrian Hoad-Reddick – hoad@hoadworks.com to register your class. Try a hand of Word Hold’Em against Jenn Dimples Lee. Print ready PDF (1-page). Feel free to share your best hands in the comments! Good luck.